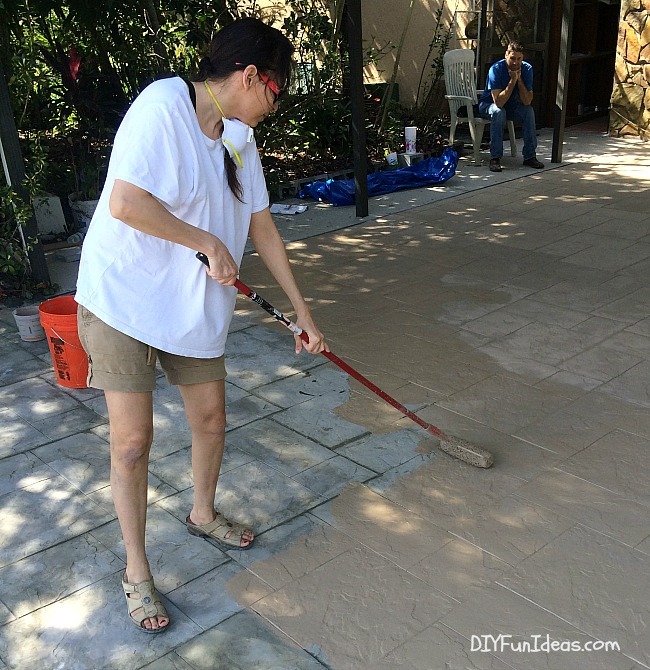 Earlier this year, a couple of buddies and I installed this amazing DIY stamped concrete tile on my Mom and Pop’s driveway and I promised to write up the tutorial for y’all. Well, it’s finally here. But I do have to apologize for taking so long to post. I’ve gotten numerous emails saying, “girl, where the heck is the tutorial?” Okay, well maybe not exactly in those words, but you know what I mean. The reason it’s taken so long to post is because I’ve been waiting for the manufacturer of this tiling system to officially launch this brand new product. After all, the tutorial is of no help if you can’t access the product, right? Luckily, it’s finally available to the public and let me tell ya that you’re going to love it. I mean that. I’m not receiving any kind of commission by sharing this with you. I’m just telling you about my own experience. Before I get on with the tutotial, let me tell you a little about the man behind the magic. 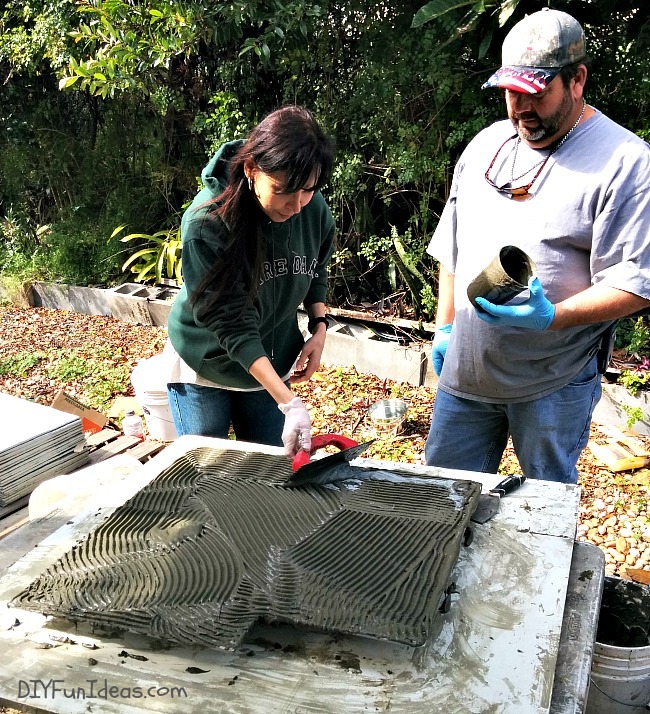 The creator of this concrete tiling system that mimics stamped concrete is Gerry Sadlier, owner of Stone Crete Systems (formally known as Countertop Solutions. 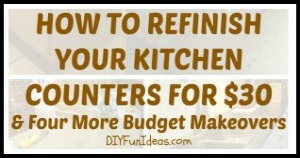 You know, the place where I learned how to make marbleized concrete countertops…you can check out that tutorial HERE. 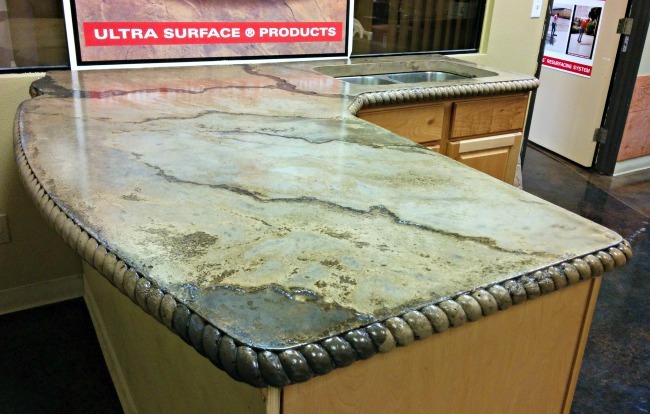 And, boy, those countertops sure are perdy!). 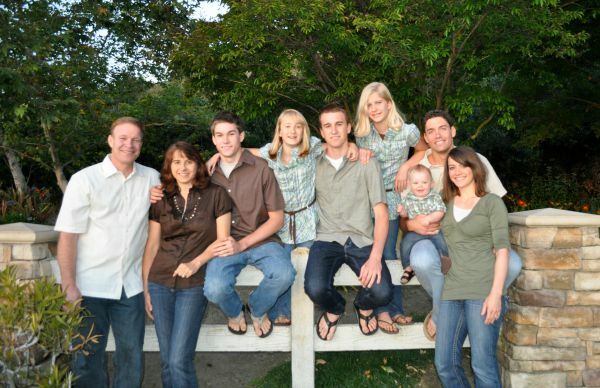 But with all his accomplishments, according to Gerry, his greatest one so far is his beautiful family. That’s Gerry on the left. 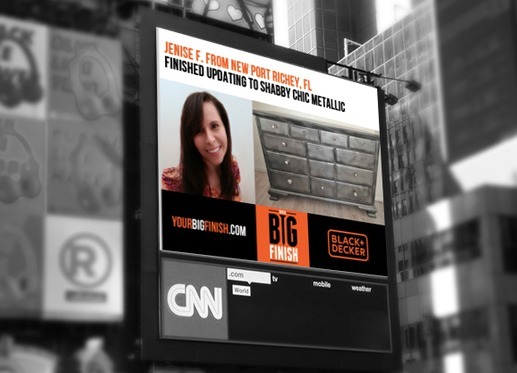 I worked with Gerry and my buddy, Scott Rogers, owner of Stonecrete USA in Tampa, on this project. 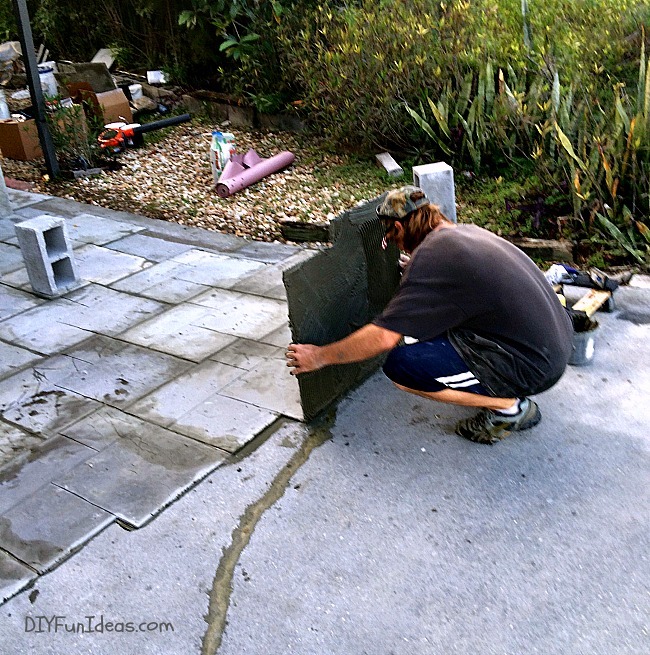 Scott’s been in the concrete biz for many years too, so between the two of them I learned a ton. To purchase the system, give Gerry a call at 619-820-9894 or email him at [email protected]. Or check out his website at stonecretesystems.com (formerly countertopsolutions.net). 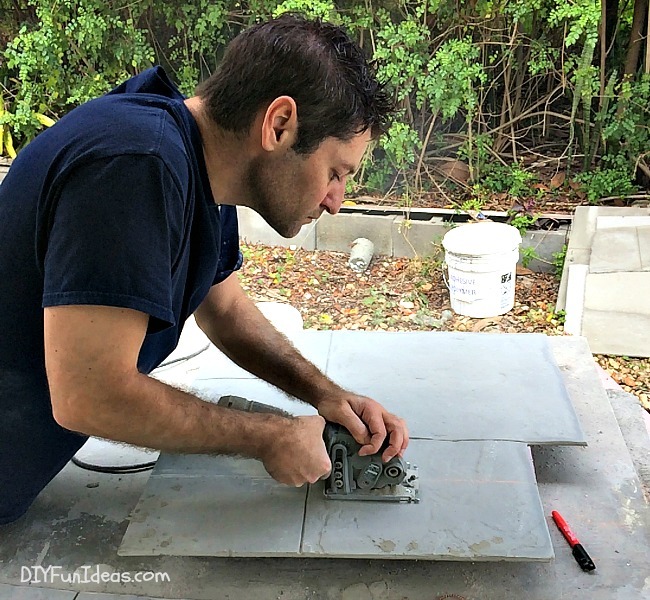 Your kit comes with reusable molds so you can pour your tiles, StoneCrete’s proprietary tile mix, adhesive mix, primer, color powder, and sealer. The molds come in two forms: one that mimics naturally shaped stone and one that is geometric shaped. 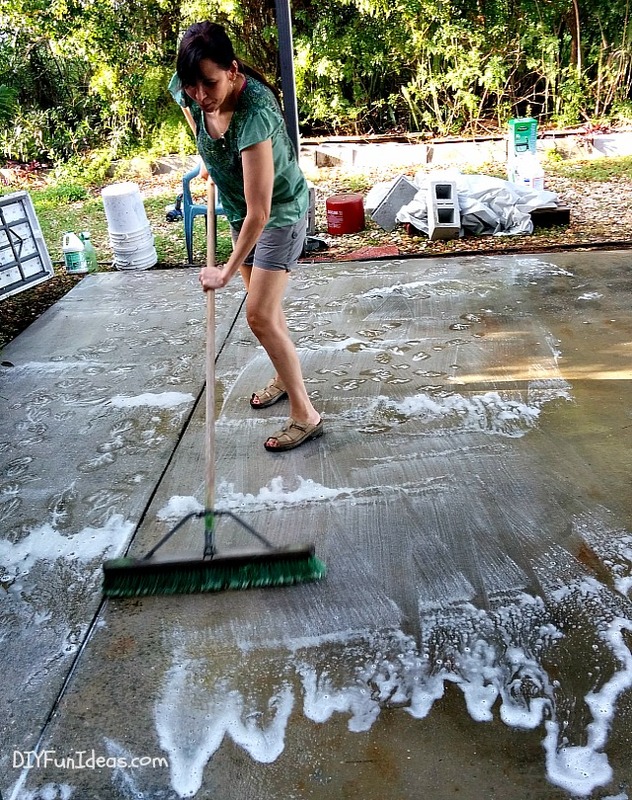 Using the StoneCrete tile admix, Scott (aka, grunt labor #2) mixed and poured all our tiles. (Thank you Scott!) 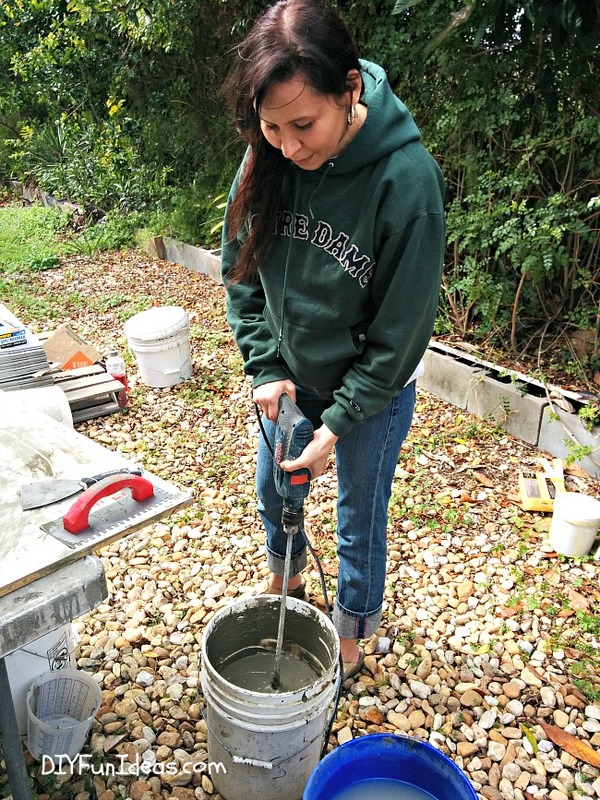 When pouring tiles, ensure that your mix is poured into the molds level with the top edges. He brilliantly rigged up this shelf thingy to set the tiles to dry vertically so they wouldn’t take up too much space. 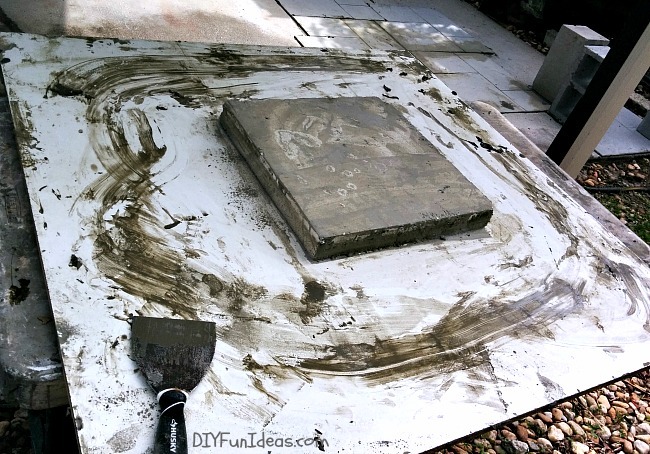 When tiles are dry and hard (in 5-8 hours), you can remove them from the molds. Scott drove the finished tiles over to my Mom & Pop’s place and I unloaded, stacking them in a nice little corner. 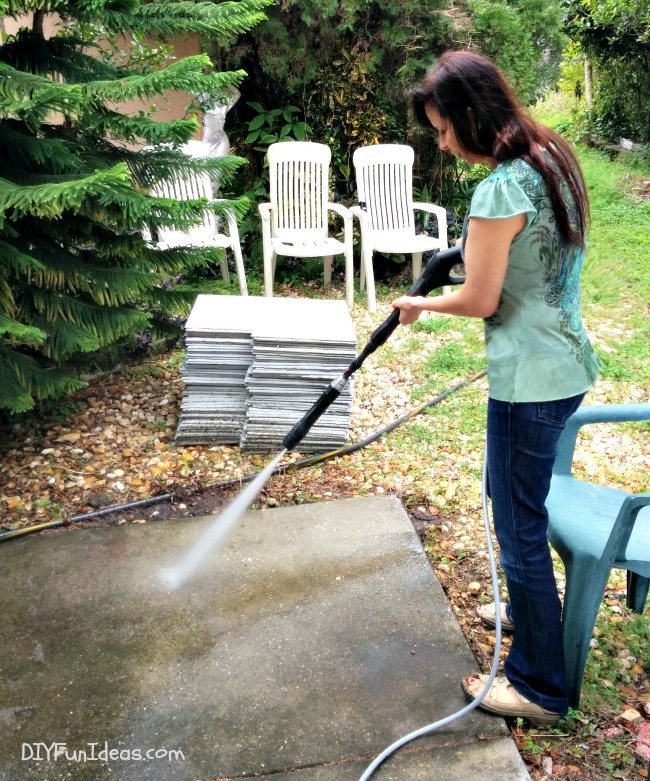 You’ll need to clean your surface by scrubbing with detergent. We used Simple Green mixed 3:1 with water. 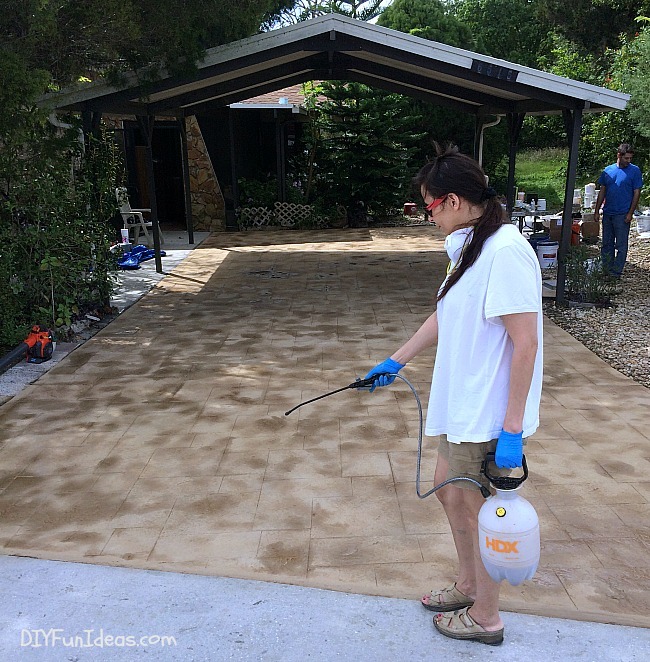 I rented a pressure washer from Home Depot and pressure washed the driveway at 3000 psi using a 15 degree tip to clean and rinse. Mix up the primer and 1-1/2 parts play sand. 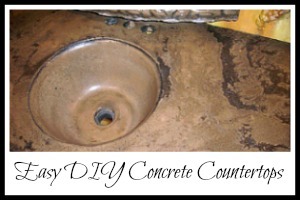 This will be used to fill any cracks and joints in your concrete. 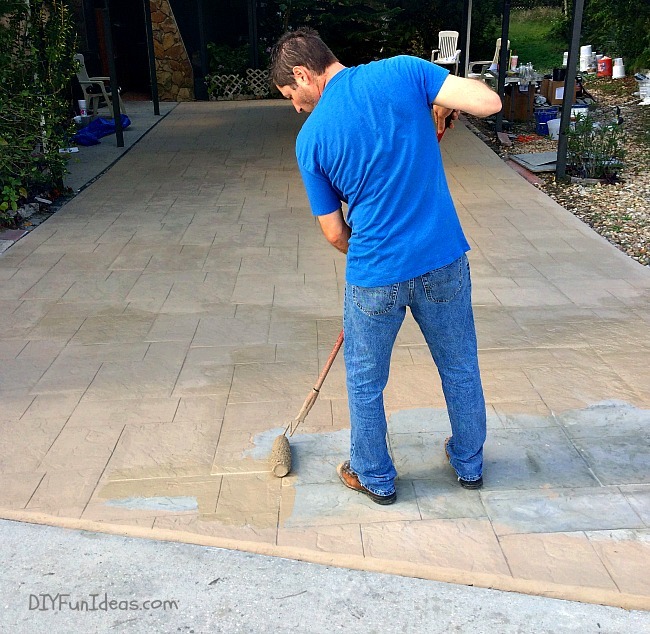 Press the primer and sand mix into the cracks and joints using a putty knife. Scrape up the excess. 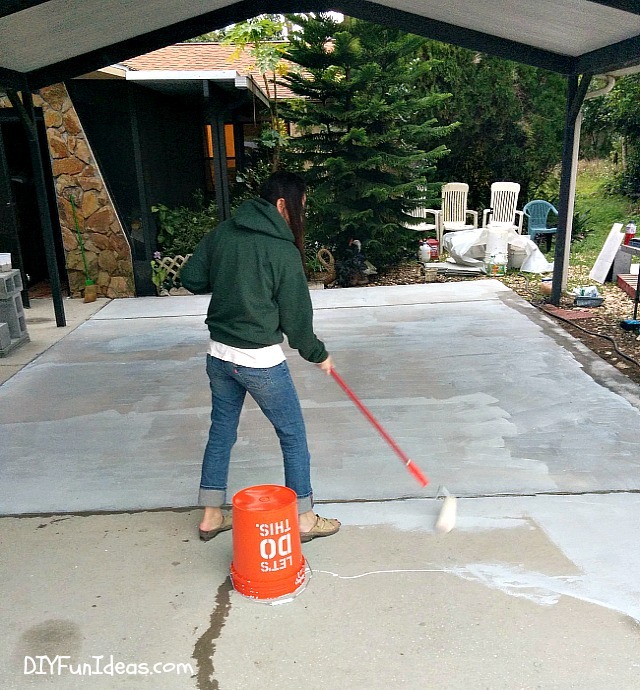 Then prime the surface with the primer using a 3/8″ nap paint roller. 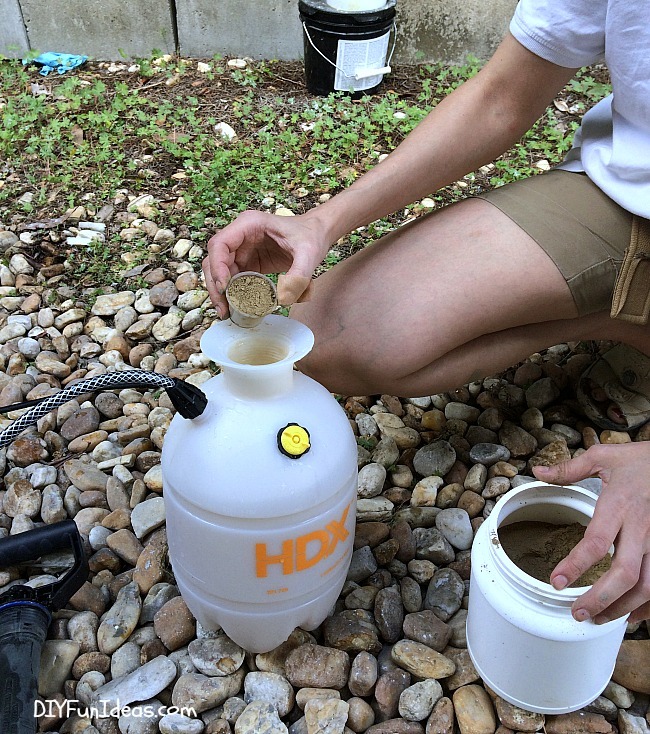 Throw a medium broadcast of #30 silica sand into the wet primer. 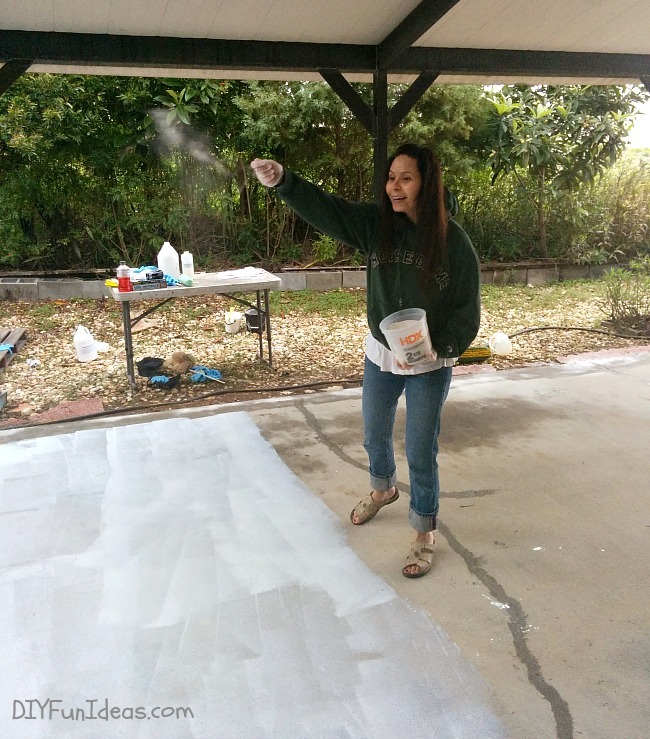 When primer dries, mix up the StoneCrete Adhesive Admix. 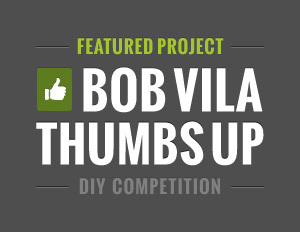 Use a 1/4″ x 3/8″ x 1/4″ notched trowel to apply the adhesive mix to the back of your tiles. We rigged up this little table contraption to lift the tile off the flat surface to make it easier to apply the adhesive. 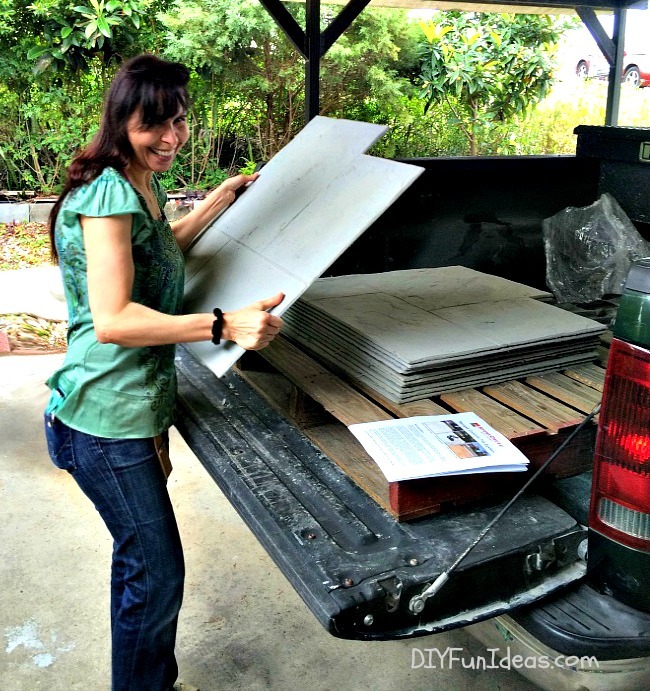 It’s a 4′ x 4′ board with a 1′ x 1′ center piece of 2″ foam (or wood) attached in the middle. 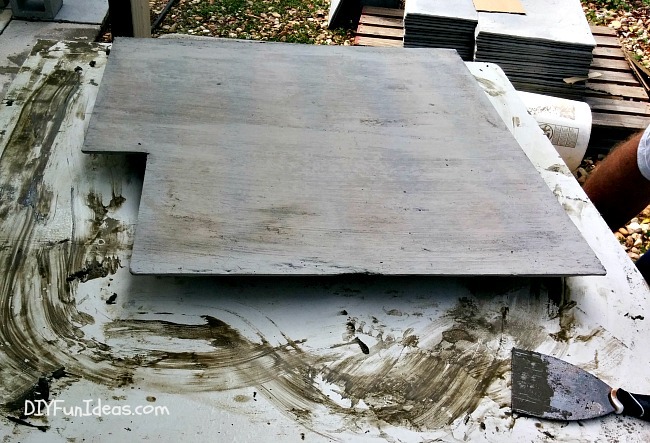 To use it, we laid the tiles upside down on the center piece of foam (or wood) so the tiles are suspended 2″ off the 4′ table below, then spread the adhesive. 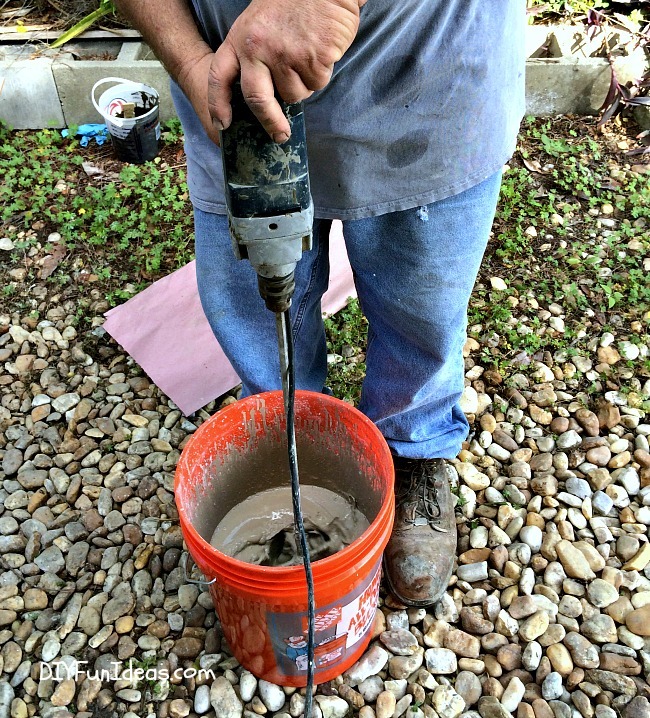 This helped keep the tile surfaces from getting dirty from the adhesive mix that spills on the table below when you trowel the StoneCrete Adhesive Mix on the back of the tile using your notched trowel. 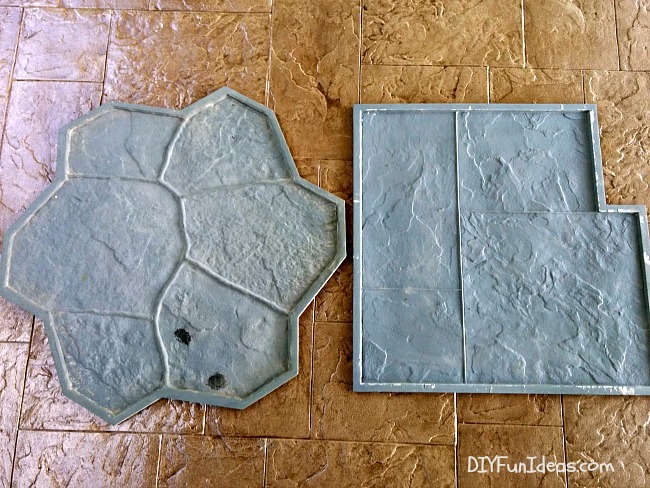 Once you’ve got your adhesive on the back of the tiles, lay tiles next to one other. 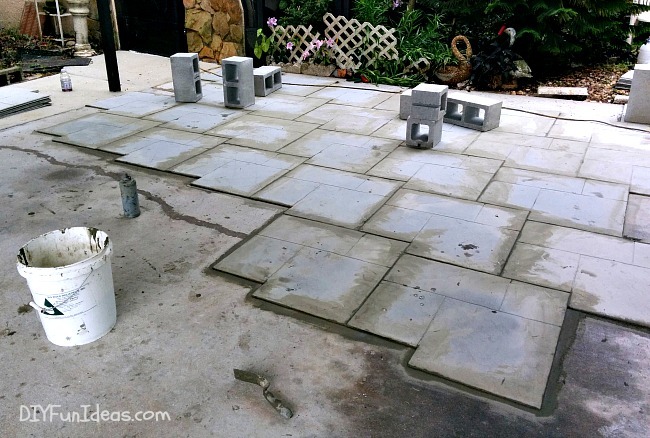 The tiles are set up so that they fit together like a giant puzzle. 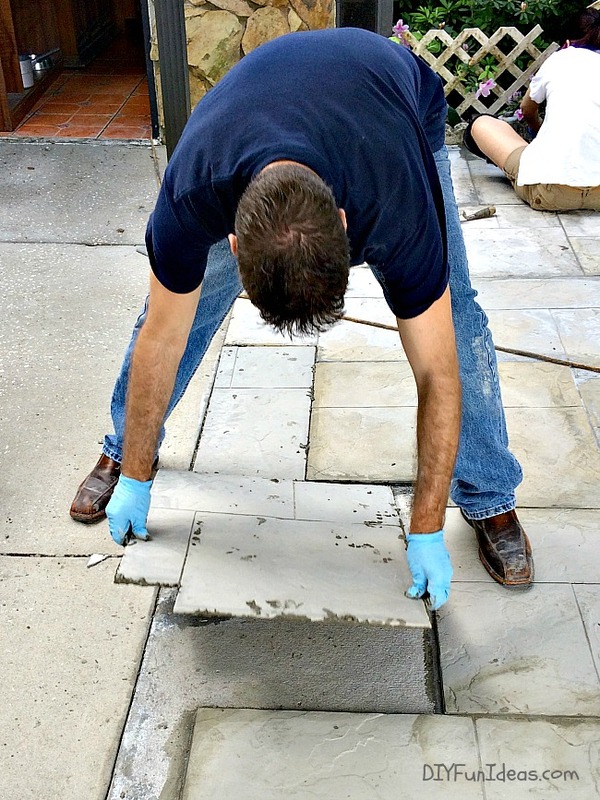 After each tile is laid, stand on them to press the adhesive into the surface. There were some areas where the tiles popped up a bit, so we uses concrete blocks where needed to hold down tile corners that may stick up over uneven areas. 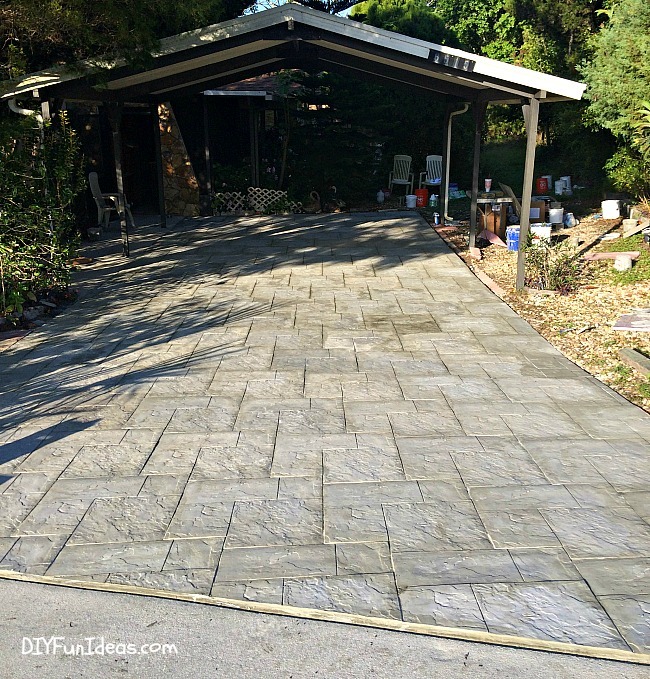 Since installing this driveway, Gerry has refined the process a little and he now temporarily screws down the corners to keep everything locked down until the adhesive dries. When you press the tiles down, some of the adhesive mix will squish up around the edges of each tile. 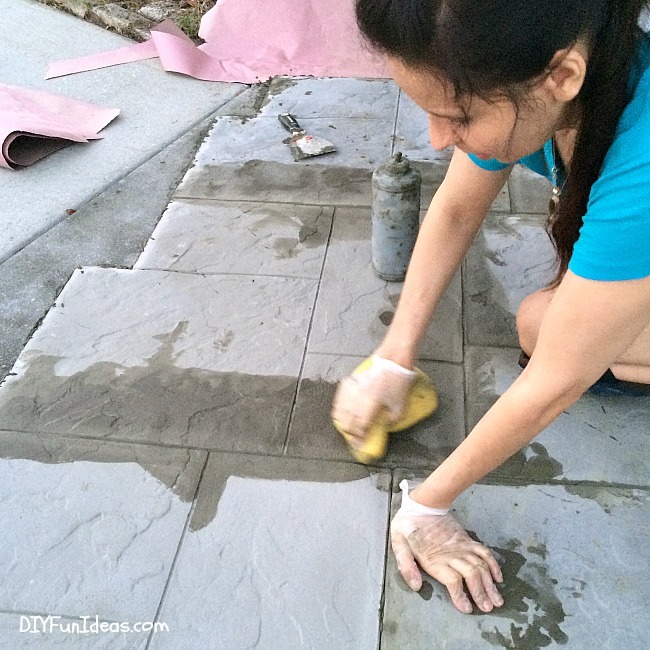 Simply use that as a grout to fill in the seams around each tile. We filled 1-quart squeeze bottles with adhesive mix to make it easier to fill the seams with more adhesive mix. Lemme tell ya, it made the grouting process so much easier! 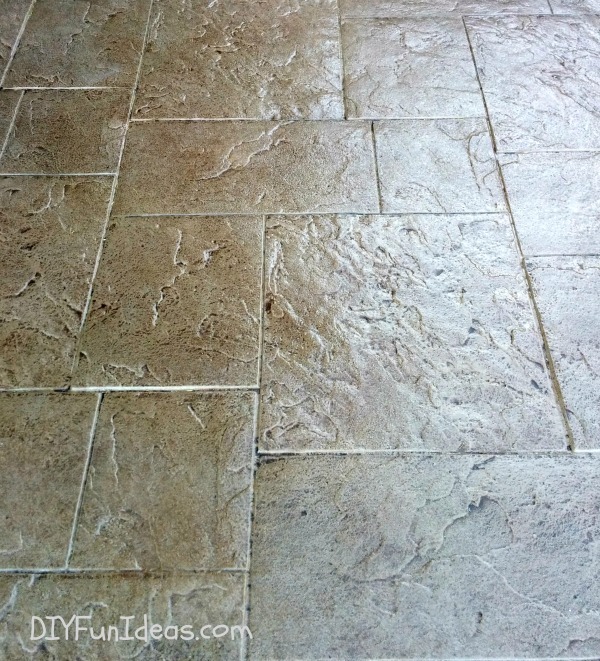 Once you’ve added additional adhesive mix along the edges, use a grout sponge to press the mix into the seams. 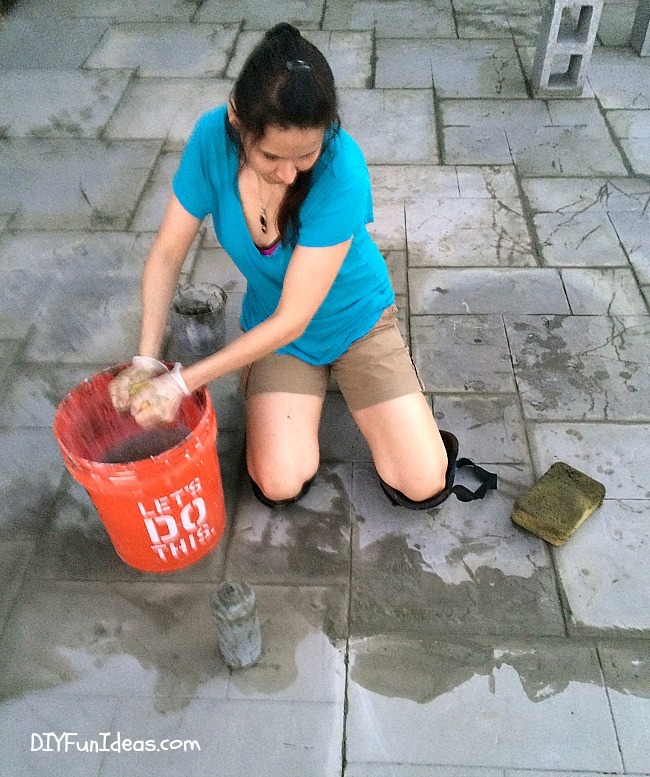 Clean and ring out the sponge often in a bucket of water as you grout the seams. And clean the excess adhesive mix from the surface. It doesn’t have to be perfectly cleaned, just feather it out to zero. When it came to the edges, we had to cut some tile to fit. 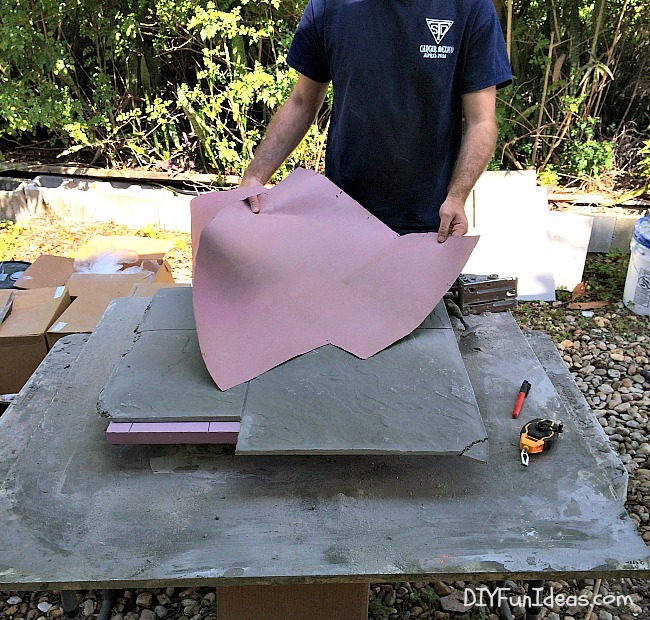 To make this easy, we made paper templates the same size as the tiles by laying a tile over the paper and cutting around the edges using a utility knife. 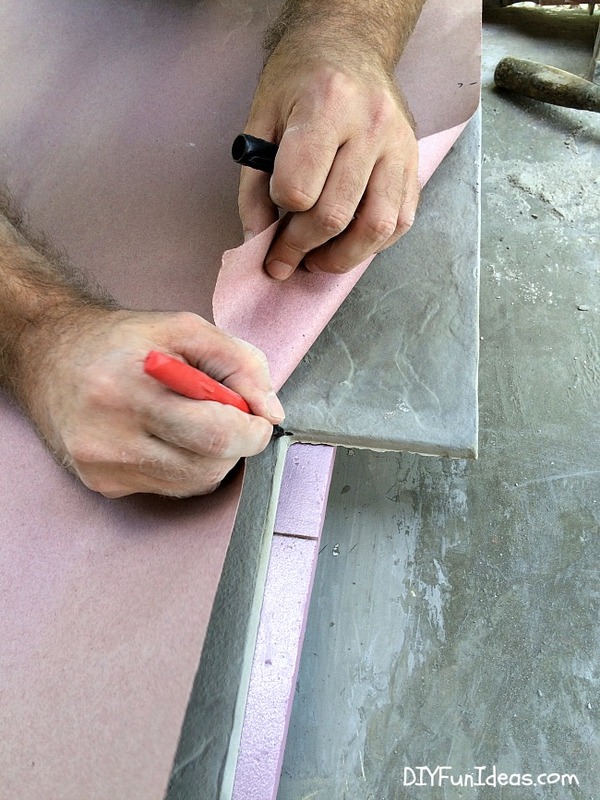 Once you have your template cut out, lay the template as if it were a tile along the unfinished edges and measure where to cut. 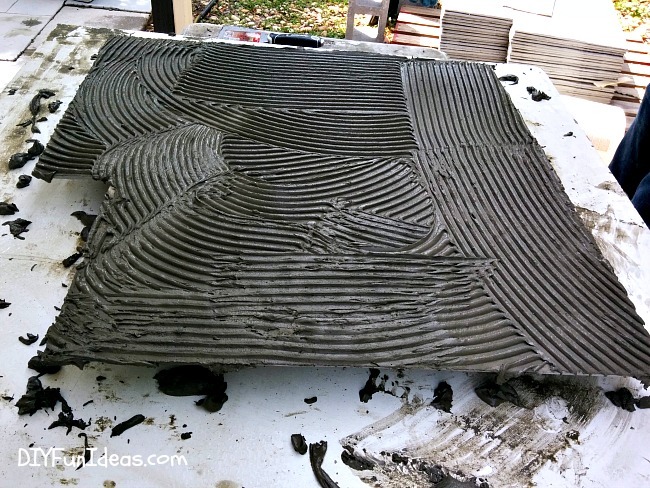 Then lay the marked template over a tile with the texture side facing up. 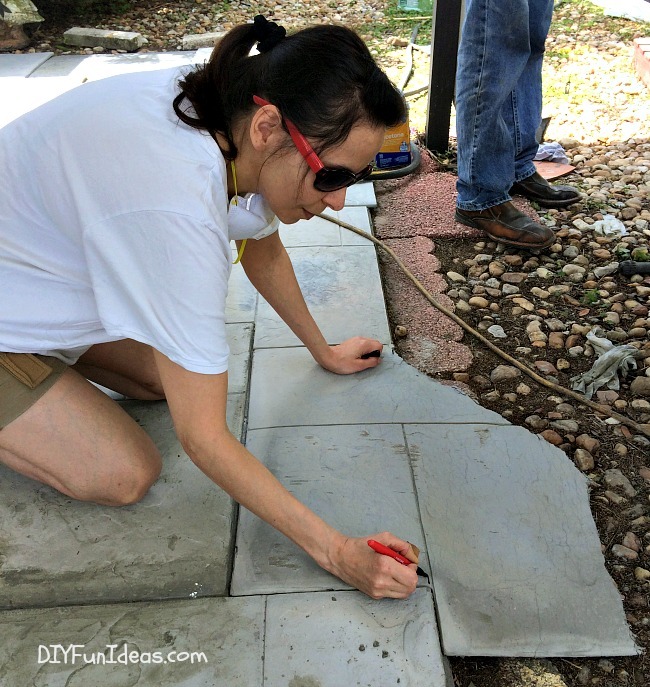 Transfer your marks onto the tile to be cut. 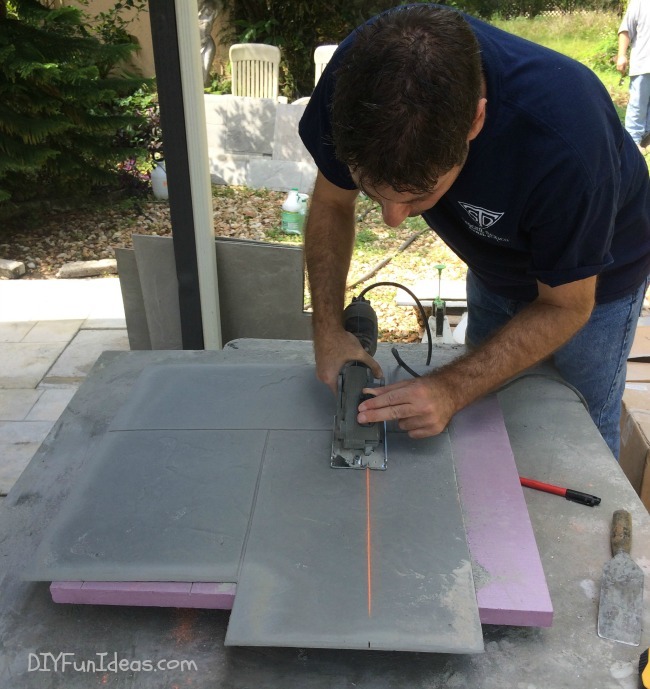 And cut the tile using a 4″ diamond blade saw. This one is made by Rockwell. 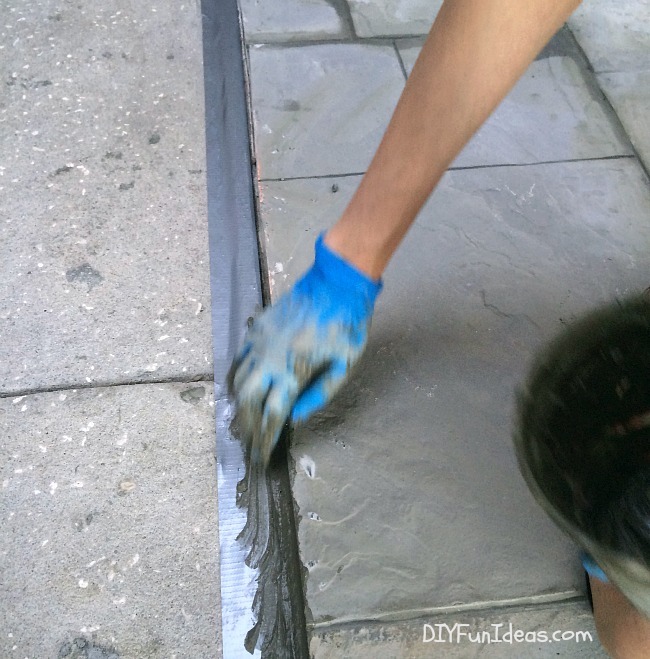 Spread adhesive on the back of the cut tile and fit into place along the edge. 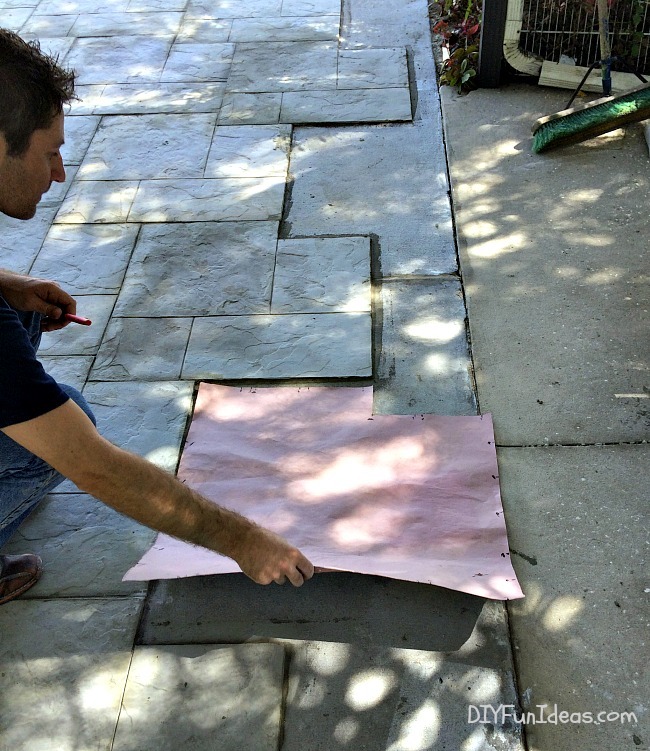 For open edges with no obstructions in the way you can lay a real tile instead of the paper template to mark where to cut. Keep marking and cutting tiles until all the edges are completed. 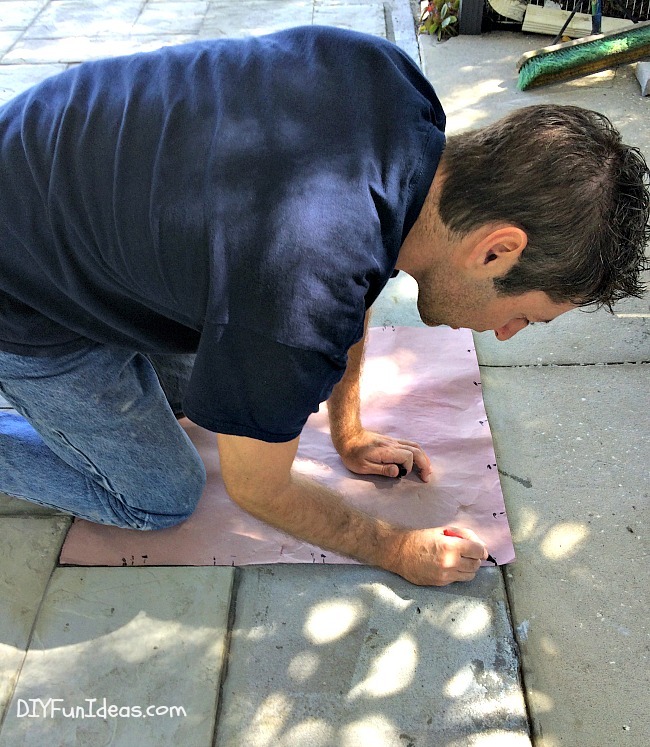 Stand on each tile to press the adhesive into the surface for the best bond. 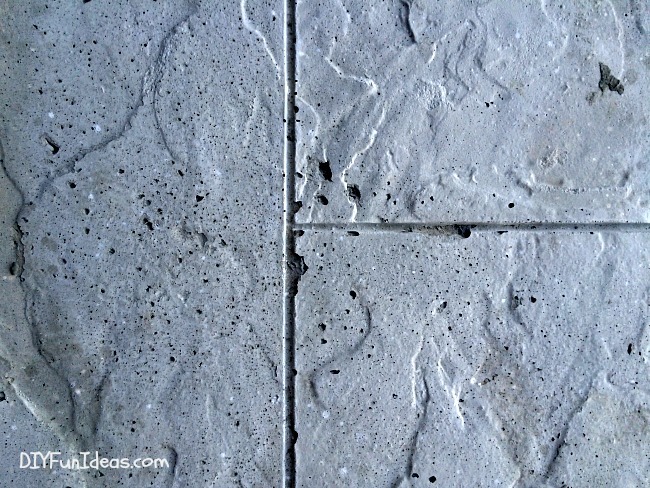 A concrete rubbing stone can also be used to touch up edges where needed. This is what your surface will look like at this point…. If any tiles have damaged areas such as pinholes or broken corners, use the adhesive admix and a grout sponge to touch them up. 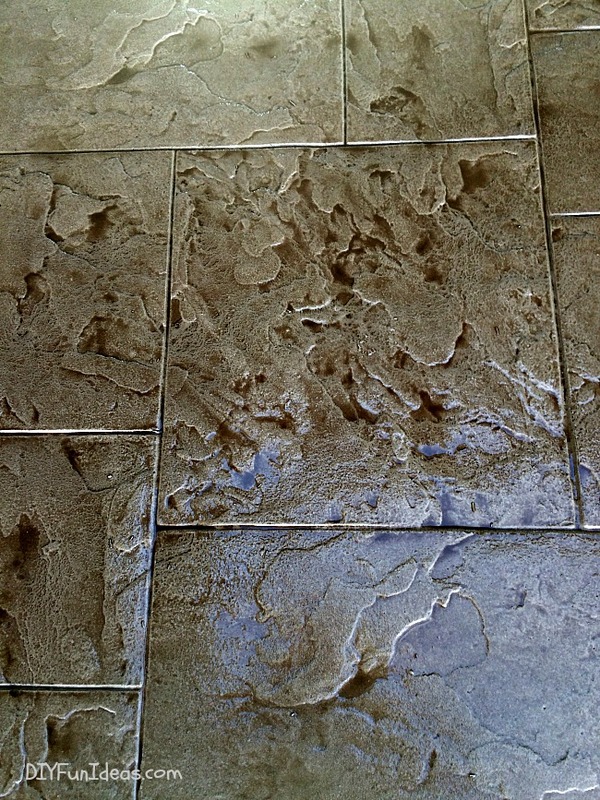 Touch up any damaged areas on the surface of the tiles with adhesive mix and a grout sponge. 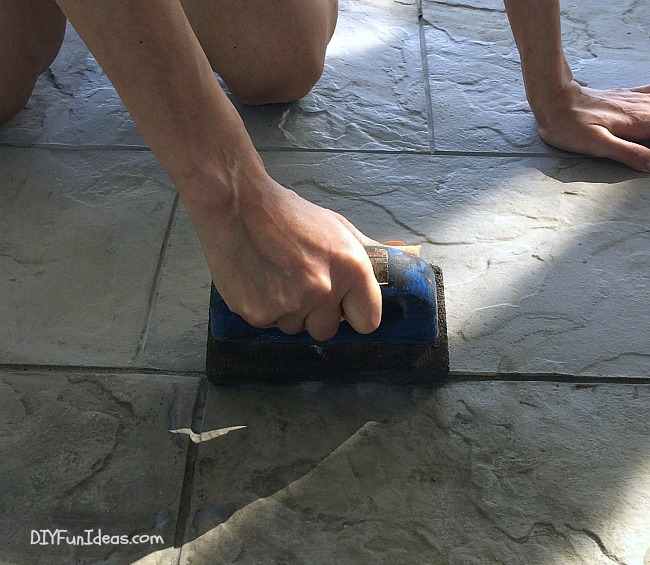 Just press the grout onto the surface and wipe with your grout sponge. This will fill in any voids. 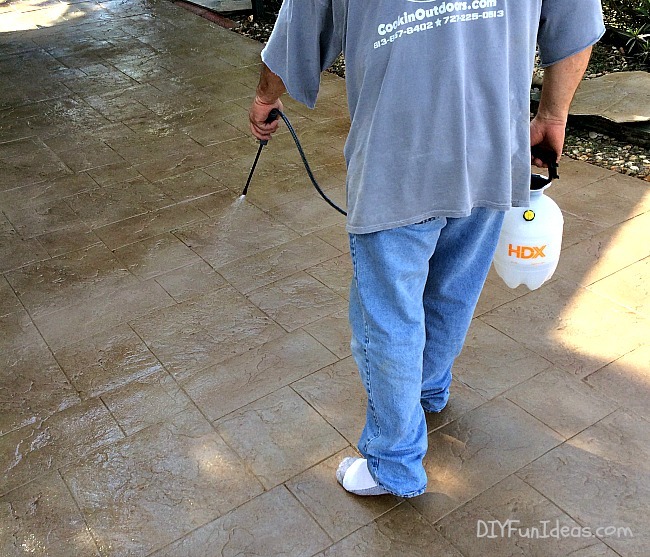 Rub Adhesive Admix along the edges of the outside tiles to cover any gaps between the tile and the surface. Sponge the excess clean. Notice we laid tape along the edge so as not to get the mix onto the non-tiled surface. Now it’s time to apply color. Before coloring with Roll-Top, blow off any dirt or debris. 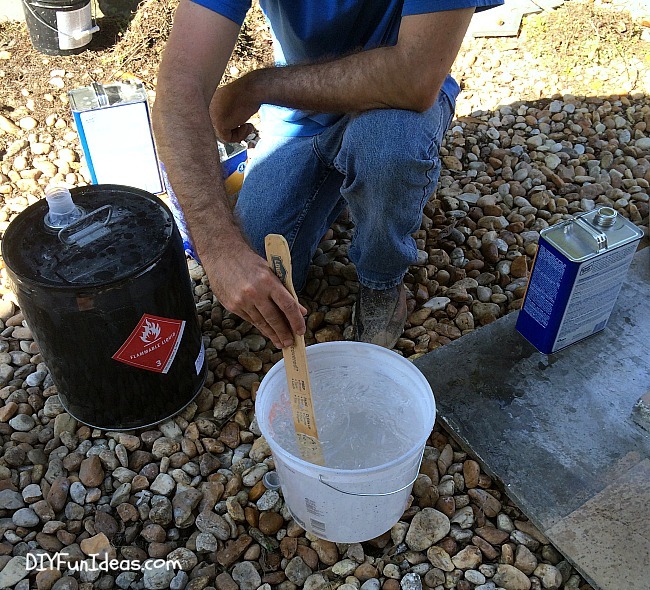 Mix Roll-Top Cement in a five gallon bucket in the color desired. (Okay, he’s redeemed himself.) Roll-Top will dry in 30 to 60 minutes. Wait 2 hours minimum before spraying antique color. To create more dimension on the tile surfaces, we added an “antiquing” color and applied it over the Roll-Top color. 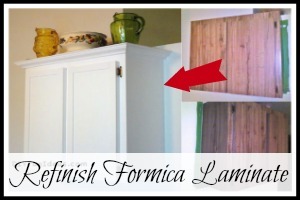 To prep the antiquing color, add 4-6 oz of Color Antique Powder to 1 gallon of water and shake well. 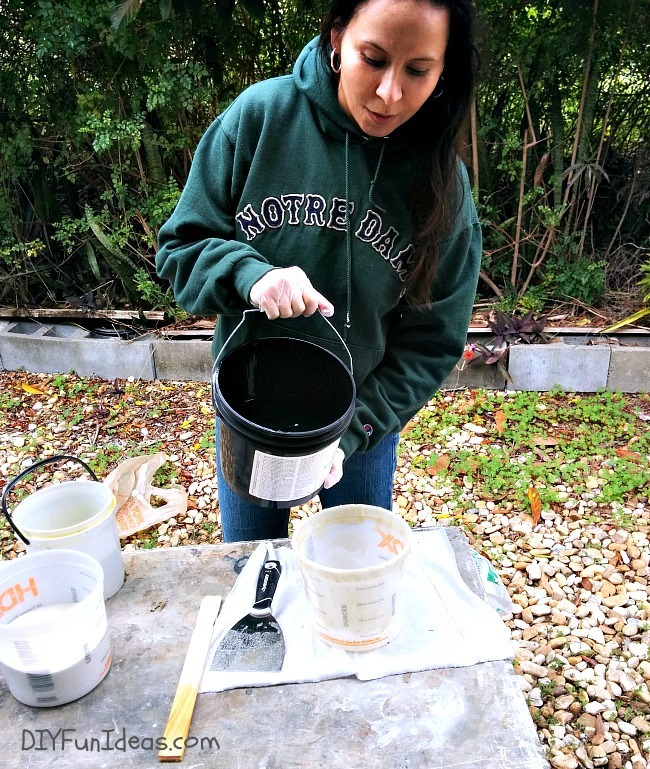 Use a small garden sprayer to spray the antique powder and water solution over the surface, letting the fluid puddle in the low areas of the texture. Spray one or more colors of antiquing after each one dries to get the antiqued look desired. 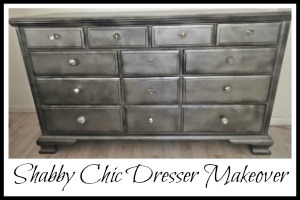 Once the antiquing color is dry, you can apply sealer. 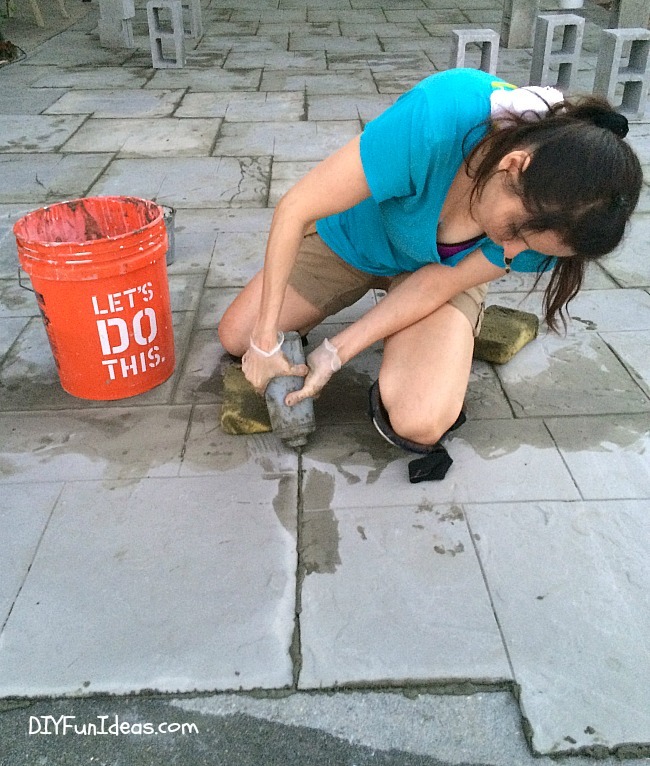 To prep the sealer, mix StoneSeal in a 1:1 ratio with acetone and pour into an acetone resistant pump-up sprayer. Apply the 1:1 ratio StoneSeal/acetone mixture. 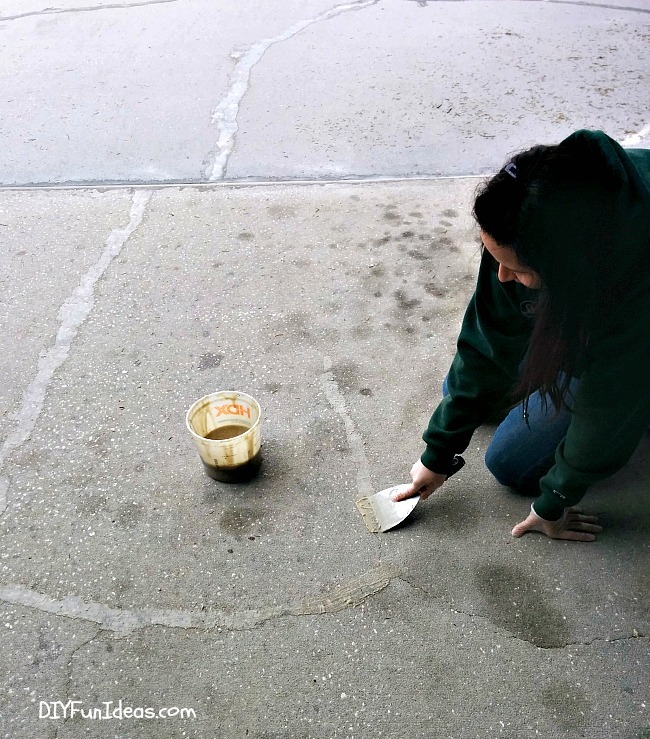 After applying the mixture, to create a slip resistant surface, lightly throw slip guard granules onto the first coat. 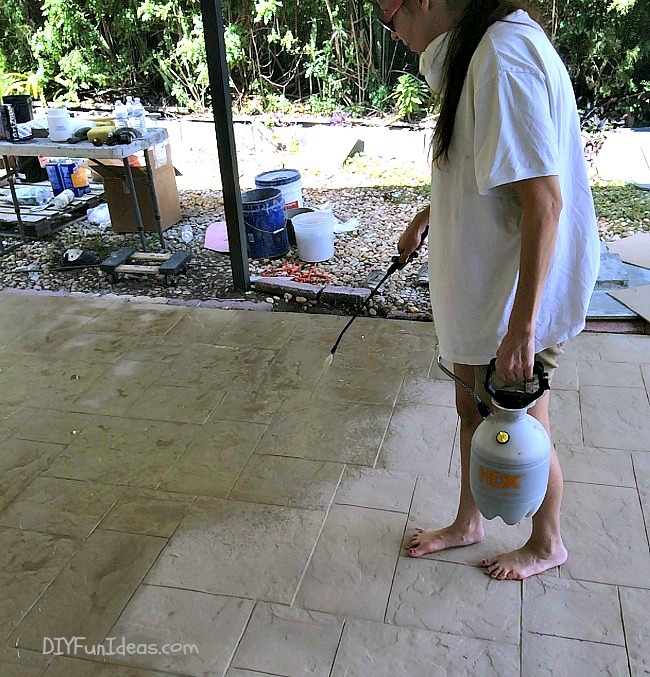 Wait for the first coat to dry, then apply a second coat of StoneSeal/acetone mixture. So let’s take a look at the before…. I wouldn’t call this a difficult job by any means, but it is labor intensive. 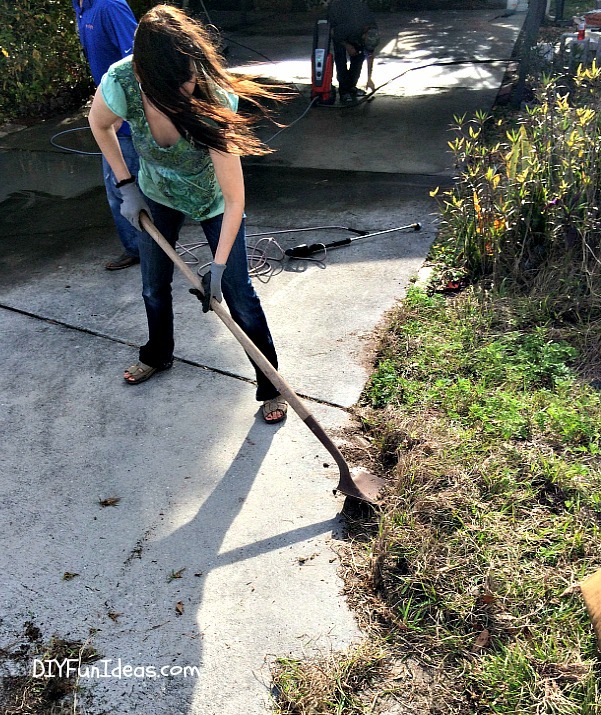 It took us about five afternoons to install about 700 square feet of driveway. So a job this size isn’t a weekend job. 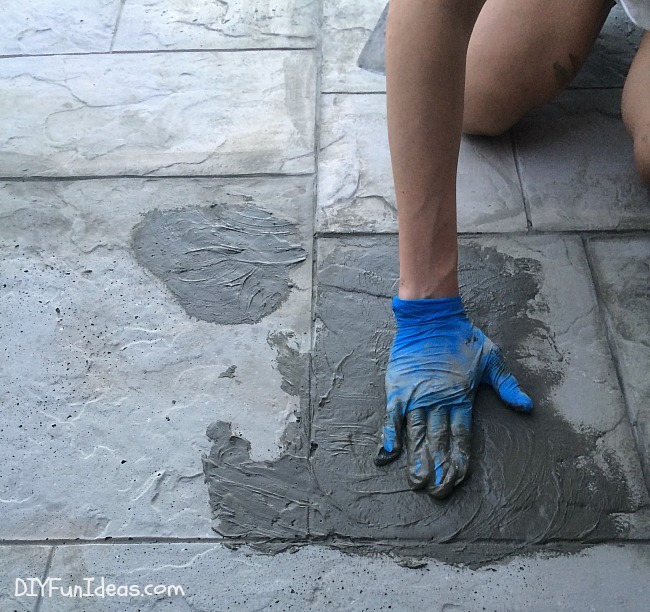 But if you’re doing a small walkway or patio, that could probably be completed in a weekend if you pour your tiles ahead of time. 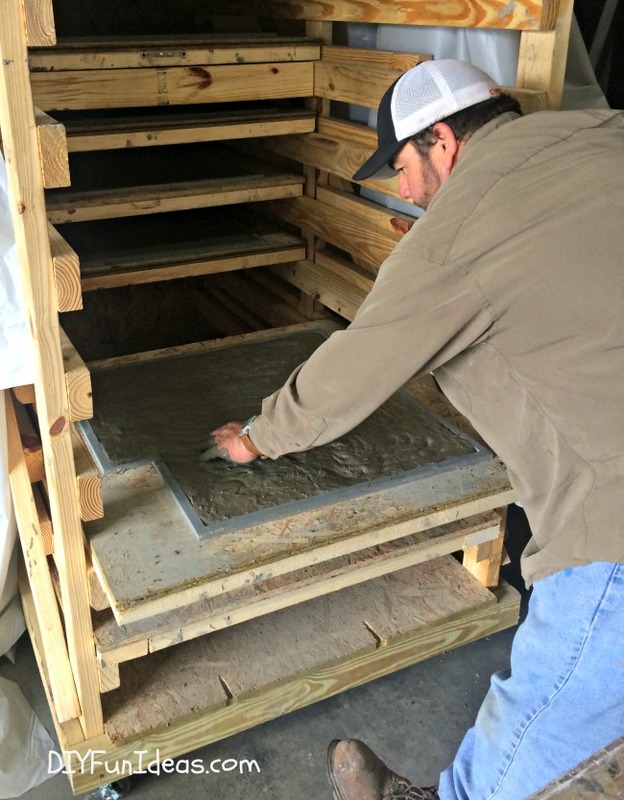 If you’re interested in learning more about StoneCrete’s stamped concrete tile system, visit http://stonecretesystems.com/ or give Gerry Sadlier a call at 619-820-9894 and he can ship your kit out to you. 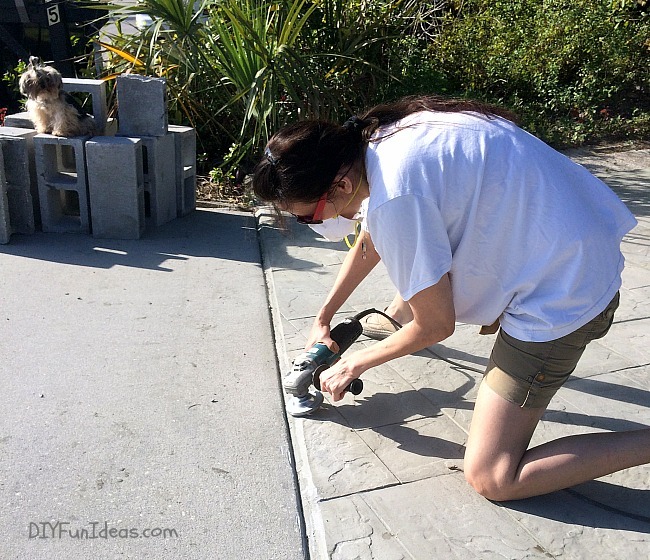 Next, learn how to make gorgeous marbleized concrete countertops! And if you’re scratching your head trying to come up with some fun holiday gifts for your friends and family, then check out this year’s Ultimate Cool Holiday Gift Guide. There’s something for everyone! 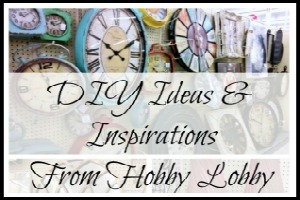 « DIY KEY HOLDER FRAME – Never Lose Your Keys Again! 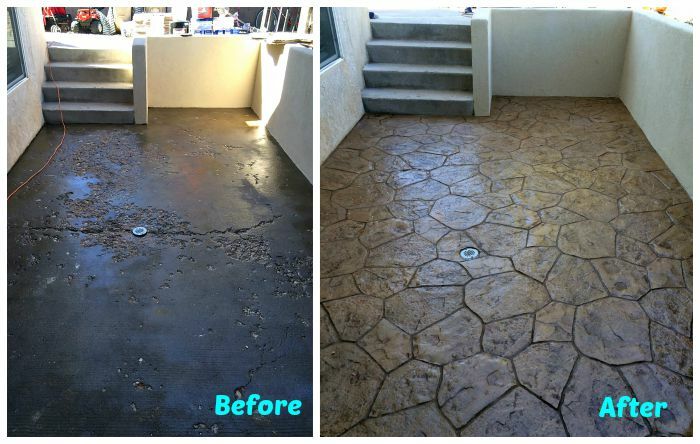 What do you have to do if you have cracked surfaces that are fairly uneven? Would have you it mudjacked to even out first? 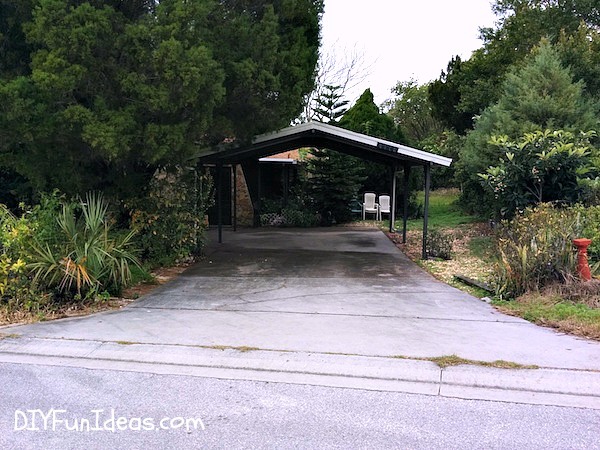 If part of the driveway is concrete and part asphalt can you go over the entire driveway? Apologies for the delayed response Thomas. 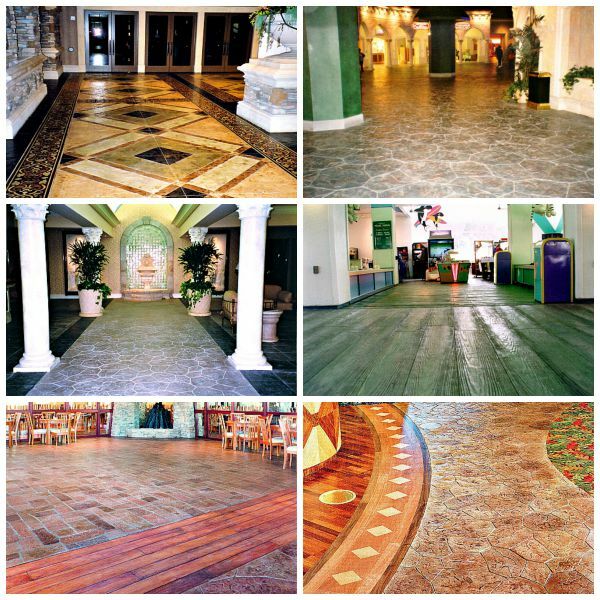 The surface doesn’t have to be completely flat, but the unevenness would be a problem. Would need to be fixed first. And, yes, you can install over a part concrete and part asphalt surface. Beautiful job and a very nice tutorial. You did a great job and the end result is lovely but I fear it would take me a life time to make the tiles and lay them. This is definitely a project for the younger gen! Probably well worth the effort if you have the stamina for the project though. Thanks for the great tutorial! Wow, this is really gorgeous! A lot of work, but well worth it!! Thanks for sharing with SYC. Thank you so much, Jann. Always love stopping by! This looks amazing. Looks like a lot of work, but worth it. Great project! Lots of work, but it turned out great! WOW Jenise!! 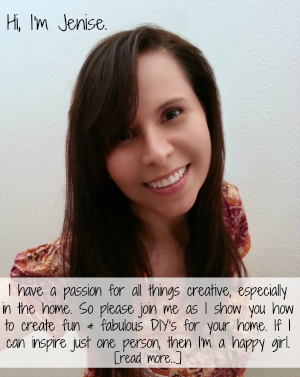 What a fabulous project!! Your step by step tutorial is wonderful!! Can this be installed in areas that have freeze/thaw cycles like colorado? Hi Jackie, Yes, absolutely, it can be installed in freeze/thaw areas. As a matter of fact, the creator of the product lives in Salt Lake City and it has been installed in numerous locations there. Hi Jessica, Sorry if that wasn’t clear. I’ve now updated it on the page to read better. But yes, you are applying a second coat of the mixture also at a 1:1 ratio. Hello, Beautiful work, and wonderful tutorial. Question: I know you said the kit came with 2 different molds. However, I noticed is some of his pictures he had wide plank faux wood, is this mold available? Hi Palino, The kit actually comes with one of the two molds. You’ll need to select one. 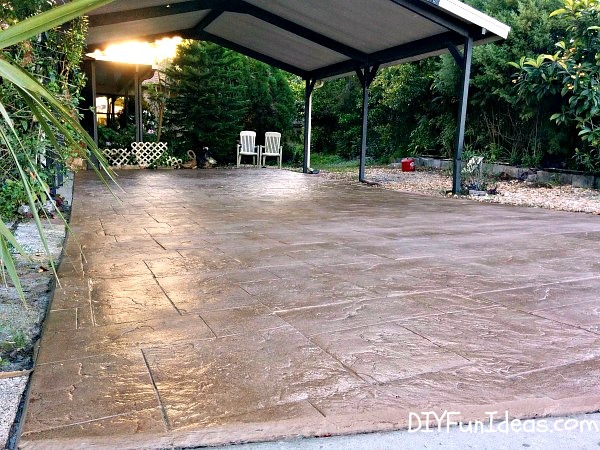 The image with the faux plank wood is from a project he did with actual 1/4″ stamped concrete, so right now it’s not one that’s available with the kit. But I do recommend reaching out to Gerry because he may be able to make a custom mold for you. Hello Jenise, what exactly is the advantage over tile? Looks like your basicly laying tile but you also have to color and seal? Awsome, Thanks! Does gerry have a web site? This is a wonderful looking project! Very impressive! I wonder, though, the concrete tiles look so thin. Won’t they be prone to cracking? Hi Cathy, Actually, because the concrete is thin it is more flexible and therefore actually less prone to cracking. 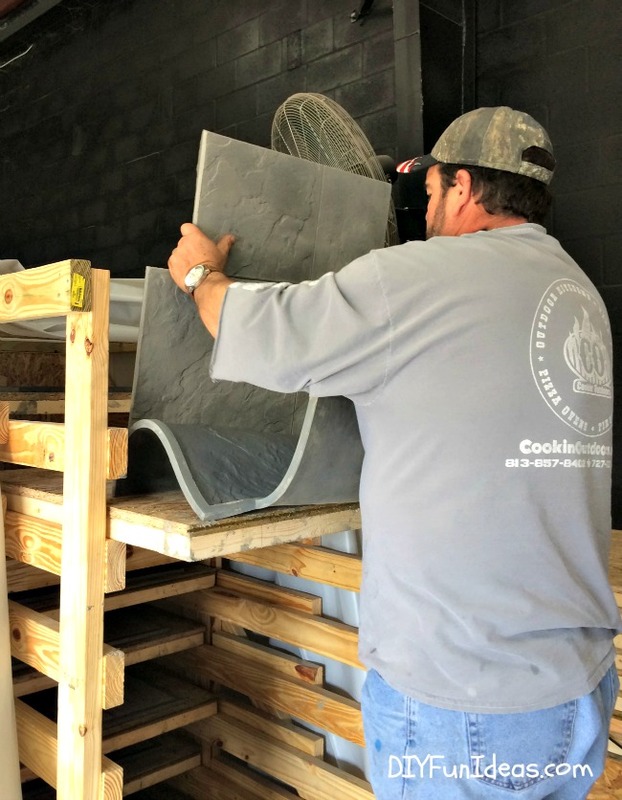 Plus, the concrete mix includes fiberglass fibers for extra strength and when you make a thinner slab, the fiberglass fibers end up laying flat on a single plane and that also makes the tile stronger than if the fibers were laying in multiple planes. Does that make senses? 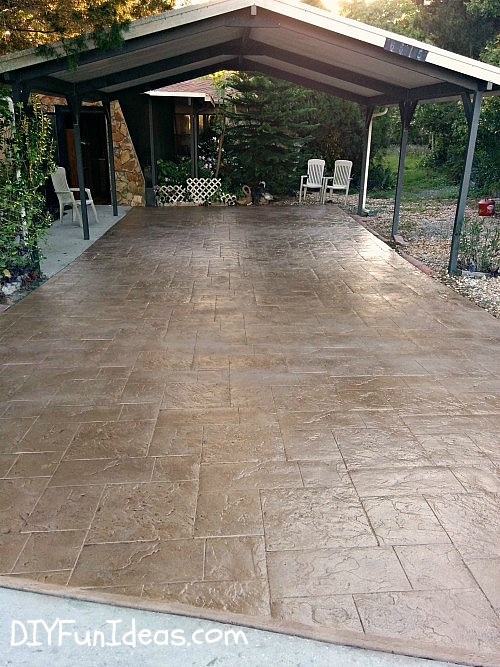 Would the roll top concrete along with the antiquing work on existing stamped concrete that needs a colour repair? 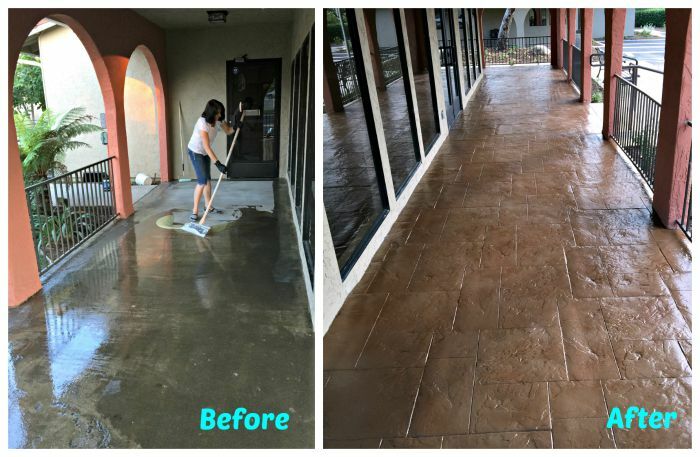 Hi Debbie, I reached out the StoneCrete, who makes the product to double check and they said yes, it will work great on existing concrete that needs a colour repair. They also sent along a brochure so I’ll forward that to your email. Thanks and let me know if you have any other questions. I can’t find the roll top online. Where can we find this and the antiquing? How would you do this on a staircase? 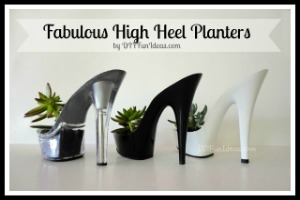 Not sure how that would work on vertical surfaces and with all the edges. 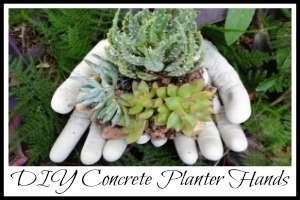 I haven’t done this technique on any vertical surfaces, but I know that Gerry who created the product has and he can give you all the details. Please feel free to reach out to him at [email protected]. Ryan, The difference is with the tiles the cost comes to $4 per square foot. 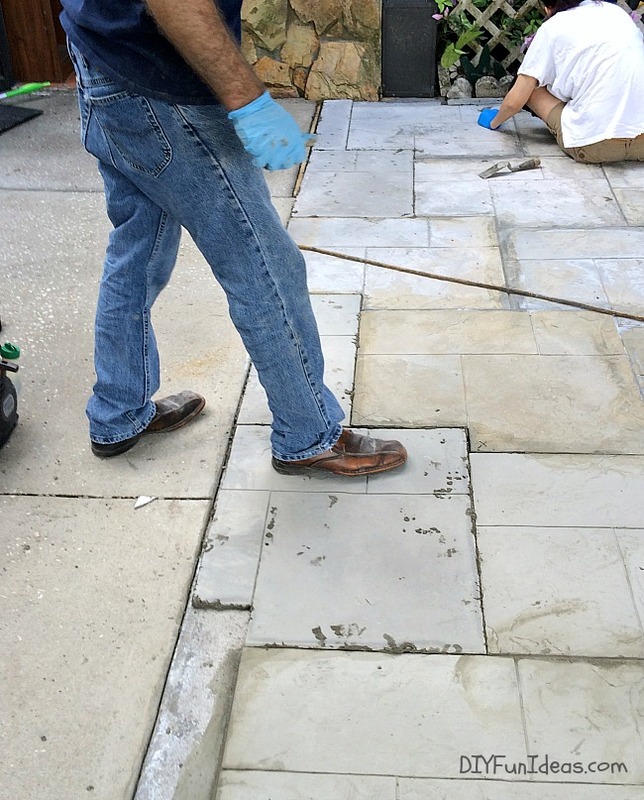 Traditional stamped concrete is about $10 per square foot. So total cost will depend on the size of your project. This system is incredible!! Is this tiling system still available to purchase? I’m not having much luck using the contact information you provided in the tutorial. Hi Jill, Yes, the system is available. They have a new website: stonecretesystems.com. You can contact Gerry directly 801-224-1347 or [email protected]. Hope that helps! 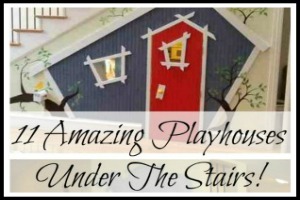 Such a super fun project and it looks amazing. 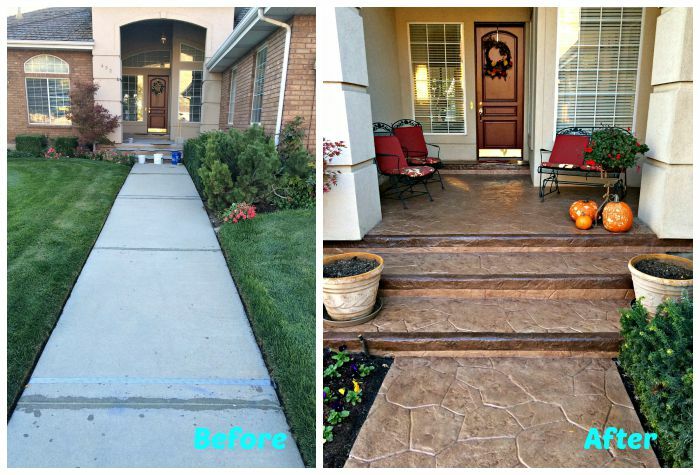 I loved seeing the step by step process as well. 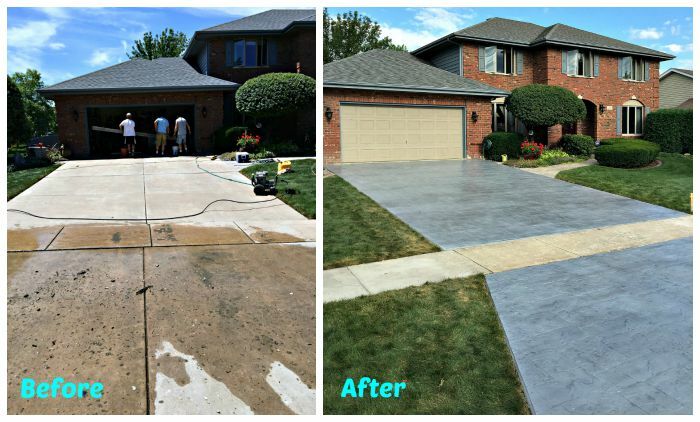 The great news about concrete is you can make almost any look you desire. 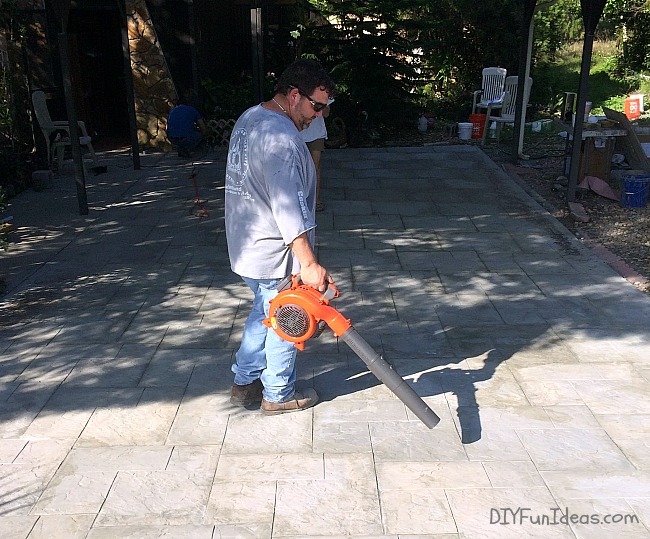 Keep in mind, if you patio, walkway or steps ever become uneven, even if they have stamped concrete tiles on top, you can lift them back into place with foam mudjacking! Does the kit come with more than one mold? 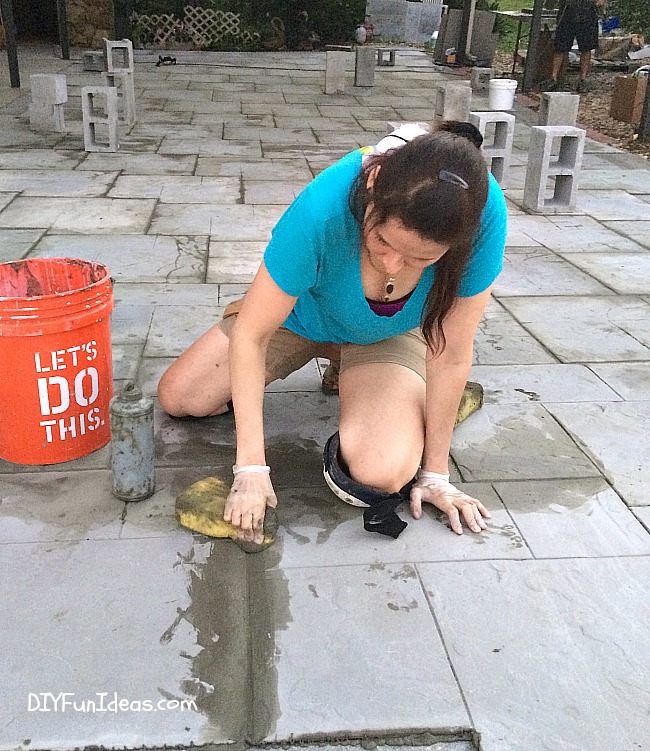 If it takes 8 hours for each tile to dry, I’ll spend months making enough tiles to cover a driveway or patio. You can purchase as many molds as you like. WOW now this is a labor of love..Love the look but not the work I definitely understand why it cost so much it’s worth every penny! whew. looks beautiful, but no thank you. once i get all the items, i may as well just pay for it to be done for me. oy vey. but kudos to you guys for your hard work, it paid off!